Christopher Healy: Chronicler of Heroic Shenanigans | The Villain’s Guide to Being a Hero! 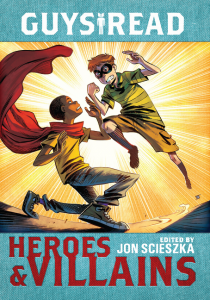 « Hero’s Guide is a pick of the Washington Post’s KidsPost Summer Reading Club! Mr. Healy, just dropping a note how much I love your Hero’s Guide books. Looking forward to the next one! My guess is that the short story is about my favorite bratty bandit, Deeb Rauber. Thanks for writing these hilarious books that can be enjoyed by both children and adults! Haha. I do really hope its about Deebie. I don´t know why, but I actually think he´s cute. (I know, right?) And he´s my favourite character. But will there be a true fourth book to the Hero’s Guide series? I’ve been waiting and hoping for one ever since the third one came out. It’s probably the best series I think I’ve ever read and sincerely hope you will do another. Eventually. Sorry I can’t be any more specific. But thank you so much for the compliment! Do you have any ideas for a fourth book? I cannot wait till the fourth book! It will be the ultimate gift for my daughter!! !